Horizontal travel between bursts of vertical rain. 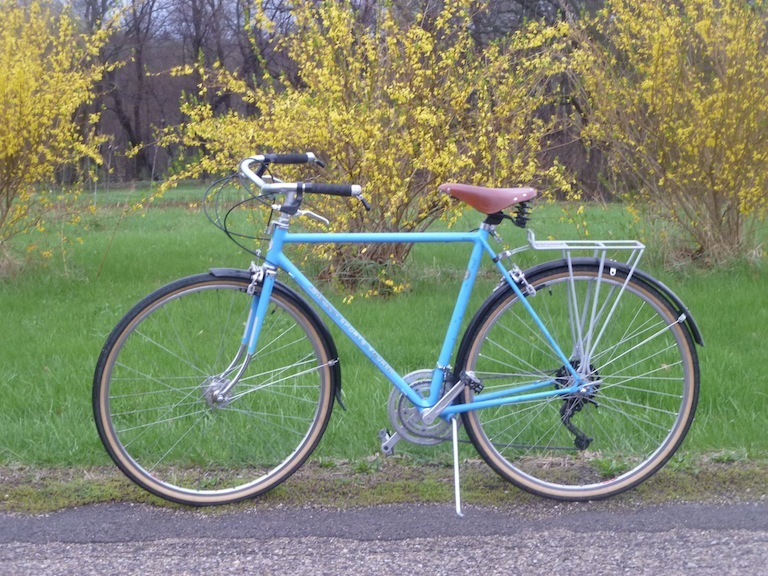 Fillet-brazed Schwinn Sports Tourer frameset, cranks, headset, brakes and kickstand are 42 years old. Front Campy and rear Phil Wood hubs are probably that old as well, though not original to the machine. Tires are 700 x 35C–without crowding the fenders. Brooks saddle still needs a bit of adjustment. Nitto Albatross bars are my current favorites. And on the 27th day, he paused long enough to take this picture. This entry was posted in Report from the road and tagged #30daysofbiking, Schwinn Sports Tourer. Bookmark the permalink.